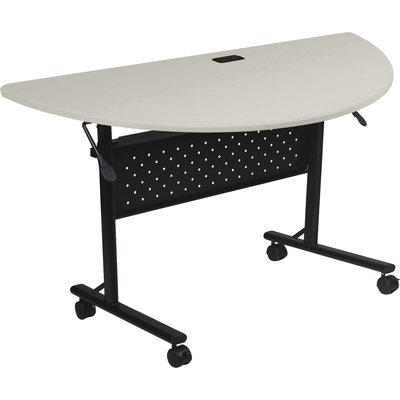 Versatile, Economical Flipper Table Is Perfect For The Training Or Conference Room. Half-Round Top Flips Back With A Simple Lever Mechanism To Nest With Other Flipper Training Tables For Space-Saving Storage. 1" Thick Top Is Made Of Vacuum-Formed Pvc With A Silver Finish, Radius Edges And Rounded Corners. A Plastic Grommet Is Positioned In The Middle Along The Straight Edge For Convenient Cord Management. Included Frame With Perforated Modesty Panel Is Made Of Black Powder-Coated Steel. Taa-Compliant Table Rolls Easily On Four 2" Casters (Two Locking)..
Versatile, Economical Flipper Table Is Perfect For The Training Or Conference Room. Half-Round Top Flips Back With A Simple Lever Mechanism To Nest With Other Flipper Training Tables For Space-Saving Storage. 1" Thick Top Is Made Of Vacuum-Formed Pvc With A Silver Finish, Radius Edges And Rounded Corners. A Plastic Grommet Is Positioned In The Middle Along The Straight Edge For Convenient Cord Management. Included Frame With Perforated Modesty Panel Is Made Of Black Powder-Coated Steel. Taa-Compliant Table Rolls Easily On Four 2" Casters (Two Locking).